For the last four months, I have been trying and failing to finish a book gifted me as a Christmas present, The Submission, the first novel by New York Times journalist Amy Waldman, released shortly before the anniversary of 9/11. I had almost completed it this week (grudgingly) before I was made aware of the depth of its popularity. I must confess, I was shocked. The book that I had considered passing to the thrift-store unfinished has in fact received rave reviews from a handful of the nation’s top papers. Ever feel like you need a cinematic soundtrack to your day to day life? 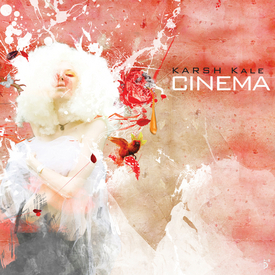 Karsh Kale’s Cinema may be for you. The album exploded on the scene last week, going straight to number #1 in the charts. No surprise considering Karsh Kale has been a revolutionary voice to the on the scene for quite sometime. Kale got his start in a rock band, is known for his phenomenal tabla skills, worked in collaboration with the talented Anoushka Shankar in 2007 and most recently has been using his skills to soundtrack movies, such as with Ajay Naidu’s Ashes. It’s no surprise then, with his recent film scoring experiences that he chose to name his latest release, Cinema. As one of the first groundbreaking genre busting artists in what is now an established musical fusion genre, Karsh Kale can only be referred to as legendary. The album Cinema takes listeners on a cinematic journey, each song reflecting a different emotion and journey. But instead of telling you about the music, how about listening to the music and deciding for yourself. And of course, download the song **Mallika Jam* for free below. The entire album is available on iTunes. What makes Karsh Kale tick? I wanted to know. Check out the interview with Karsh Kale, and just to mix it up, I asked him to answer in triplicates. Read it below! What are three words you’d use to describe your 4th solo album, Cinema? What were your top three favorite moments in creating this album, Cinema? The day the art work by Archan Nair arrived. The day I finished the final mix w Illinton. Last month, the hard rock band Slant dropped their second self-titled album on to the scene. 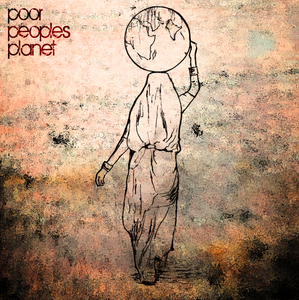 Based out of Southern California, Slant is foursome band with two Bengali guys (Fahim – lead singer, Munir – guitars) and two Russian brothers (Ilya – bass, Andrew – drums). I’ve seen the incredible growth of Slant over the years, from when teenage Fahim used to play guitar in his mother’s living room to seeing him perform on stage years later at the world famous Roxy on Sunset. In the latest album, you can hear the maturity to their sound – the musical composition is richer sounding than their first album, and the hard rock sound is soulfully anthem-ic without sounding narcissistic. 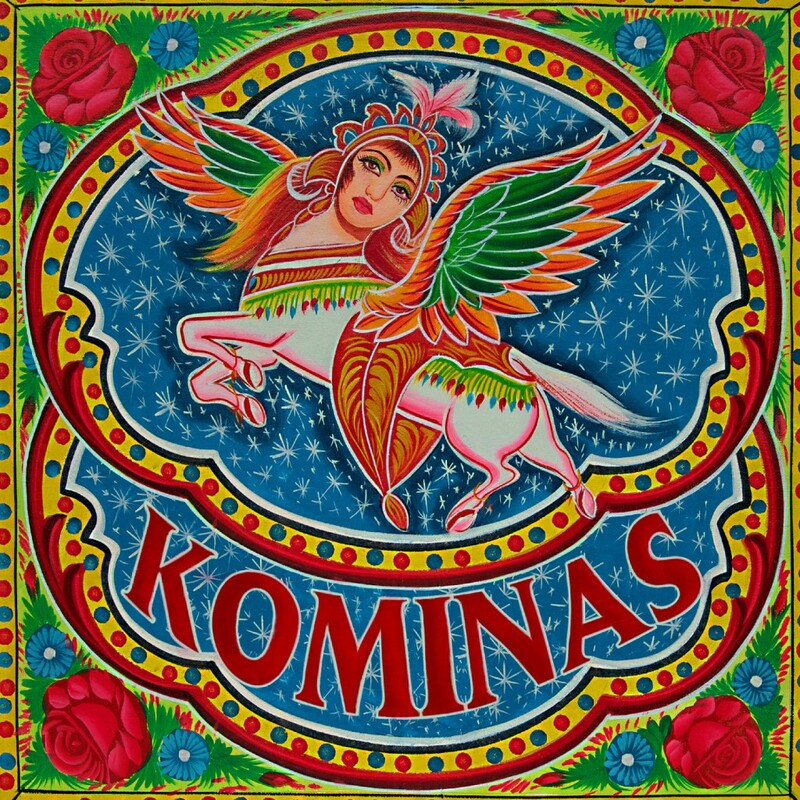 You can read a detailed album review here. I’m not much of a rock music fan (unless there’s a punk in front of it) but I do appreciate Slant’s latest album, particularly the song Beautiful Angel, a song about a family friend of ours that was brutally murdered a couple years ago. 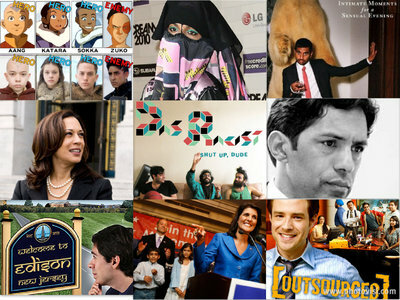 You can download both Slant’s first album ‘A Thin Line’ and their second self-titled album off of iTunes or CDBaby now. But, exclusively for Sepia Mutiny readers, the first person that responds in the comment section with the name of three cities in Europe that Slant has performed, will get an autographed copy of their latest album (don’t forget to leave your e-mail). I spoke with lead singer Fahim Zaman and guitarist Munir Haque about dropping their second album, the inspirations and their journey to making this album. You can read it below! For those that don’t know Slant, who are you guys? Ali Eteraz is a name well known to the blogosphere, and of course, Sepia Mutiny. A Pakistani-born Muslim American, lawyer, writer, and activist, Ali’s writing has often been quoted here at Sepia Mutiny, and this Oct 13th Ali’s highly anticipated memoir Children of Dusthits a bookstore near you. Soon after 9/11, a friend of mine told me that her college roommate’s home had been visited by the local police in their town in upstate New York. The police wanted to search the home of this family because they’d heard they had a picture of Osama Bin Laden hanging in their living room. The cops were mistaken. This was the home of a pious Sikh family and the picture was of Guru Nanak, the founder of the Sikh religion. A few years ago, Ask Me No Questions by Marina Budhos was one of the first young adult offerings to address the challenge of growing up South Asian and Muslim in an America altered by 9/11. 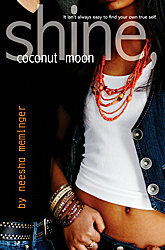 First time novelist Nisha Meminger takes on a similar theme in her new YA novel Shine, Coconut Moon, just published by Simon & Schuster. As Samar gets to know her uncle, she begins to learn about Sikhism and gets to know her grandparents. She even visits a gurdwara for the first time in her life. This prompts her to start questioning her mother’s decision to raise her to think of herself “like everyone else.” She begins to question her identity; wondering whether she is a coconut — someone who is brown on the outside and white on the inside–someone who may physically appear to be Indian but doesn’t know who she really is. At the same time, she is shocked and saddened by a series of troubling events in her community that affect her personally: her uncle is attacked by a bunch of teenage boys who goad him to “Go back home, Osama!” and the local gurdwara is set on fire. In his compelling Guardian article “The End of Innocence” Pankaj Mishra writes, “‘Post-9/11′ fiction often seems to use the attacks and their aftermath too cheaply, as background for books that would have been written anyway.” Shine, Coconut Moon does not fall into this category. Most definitively shaped by the effect of 9/11 on minority immigrant communities, this is an ambitious coming of age novel for young adults that seeks to demonstrate the effects of fear mongering on the lives of ordinary minority teens who saw themselves as American before 9/11. I grew up reading almost exclusively sci-fi and fantasy books, sometimes one a day during the summers. I was like the main character in Oscar Wao except I wasn’t fat or bad with the ladies (well…I wasn’t fat). To this day, even though I blog for Sepia Mutiny and am surrounded by talented co-bloggers, some of whom are authors, I have never read a single book of desi-fiction. Ever. I have no excuse at all. It just hasn’t happened yet. I read books to escape into worlds that I can never be a part of, or to get smart on something that I want to know more about before I die. Desi-lit, no matter how far removed from my experiences, just seems too close. Every time I pick up a book of desi fiction I tell myself that this time I will read it, this will be the one…only to push it aside once again. Nobody has to tell me, I already know that it is my loss. I have a theory about books. I believe the right book falls into your hands when you are meant to read it. You don’t pick books, they pick you. I haven’t read a science fiction or fantasy book in at least a decade by the way. 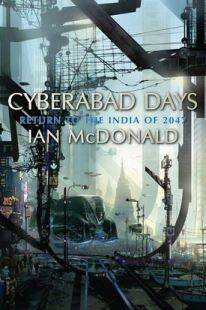 Cyberabad Days returns to McDonald’s India of 2047, a balkanized state that we toured in his 2006 novel River of Gods, which was nominated for the best novel Hugo Award. The India of River of Gods has fractured into a handful of warring nations, wracked by water-shortage and poverty, rising on rogue technology, compassion, and the synthesis of the modern and the ancient.